Description: A pair of B32-8WH's pass the Clara St Tower at NOUPT. At the time this power was used on the Sunset Limited. Description: I think this was taken at McCook. It has been awhile since it was taken. 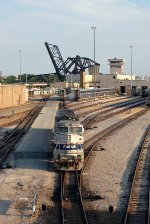 Description: In mid August 1994 Amtrak and BN ran an inspection train between Seattle and Vancouver BC; the route would eventually get its own service with Talgo equipment. 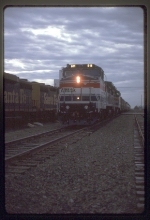 Description: A B32/F40 duo team up to lead the Texas Eagle into Fort Worth. Description: 511 leads the Texas Eagle into Fort Worth on a hot June day. This is my favorite Amtrak scheme of all their fleet. Description: A Dash-8 leads today number 11 south out of Tacoma. Description: Coach car 34126 being backed up for loading on to flat car for transport. Superliners from P052-18, April 18, 2002 Crescent City, FL derailment are being prepared to be moved from Sanford Auto Train station to from what I was told, to the FRA's Transportation Technology Center, in Pueblo, Colorado. Two of the liners I understand were/are to be used for terrorist/hostage type training by law enforcement and one was going to be blown up for research purposes. P052-18 derailed cars 3-23, after passing over a track buckle/sun kink. Sleeper 32100 ended up on its right side in a ditch, the derailments 4 fatalities were from this car. Coach car 34125 was found, upright, perpendicular to right of way. While coach car 34126 was found on lying on its left side. The cars left Sanford approx. June 16, 2005. Title: AMTK 511 Never thought i would see this paint scheme again. Description: SB Amtrak #58 CITY OF NEW ORLEANS pulling into Hammond with seven GrandLuxe Rail Journeys (former AOE) bound for New Orleans. The train had a total of 13 cars and three motors. Description: NOUPT Switcher stands by with KCS Southern Belle and Grand Luxe Express in the terminal. 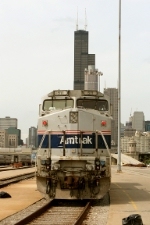 Description: Amtrak 511 poses under the Sears Tower. Description: You have no clue how excited I was about this. As this is just awesome. 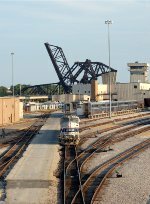 Description: Amtrak Special 835 heads south for New Orleans. It's been participating in mock SRT training with various law enforcement agencies in LA & MS.